Help! Why is my dog barking so much, Newstead Vet? Help! How do I stop my dog from barking too much, Newstead Vet? I often get complaints from my clients that their doggies bark too much. It is sometimes tricky to get them to see that barking is normal behaviour for dogs. However excessive barking can become a problem and a source of strife within your family and your community. One way of finding out the severity of barking is to ask your neighbours if your pooch barks when you go out. Does your pooch bark all day or only at certain times of the day? You could also try installing a nanny cam and see for yourself. Why is my dog barking so much, Newstead Vet? Dogs bark for numerous reasons and hence solutions can vary from one pooch to the other. Here are some reasons that may be causing your four-legged companion to bark excessively. Is my dog bored, Newstead Vet? You have seen it on telly before: a bored kid is a destructive kid! Exercise your pet in the morning before you go out to work. Not only is it good for your pet's mental and physical health, it is also good for you. Try feeding them a meal in the morning to encourage them to take a nap (very much like how I would love to sometimes!). Leave interactive toys out for him / her to play with. If you like, alternate access to different toys daily - this keeps the toy 'fresh' and exciting for your dog. One stimulating game I like to play with Diesel and Dolce is “Seek”. I hide some of their favourite toys around the house and get the doggies to search for them. Doggie day care has become popular recently and it is a great way for your furry kid to socialise with other doggies and keep him / her out of trouble. How about a dog walker? I spent a few summers walking dogs as a part-time job for busy professionals - and I found that it really made a huge difference to the anxiety levels of the dogs after a good 30 minute wallk. Is my dog anxious, Newstead Vet? This is a very common behavioural problem I see in the clinic. There are several treatments available but many owners are quick to jump onto drugs. I agree that training can sometimes be frustrating and unrewarding but I still prefer a “non-evasive” method. The goal is to train your pet to be calm whenever you are out. It pays to ignore attention-seeking behaviour and only reward your furry kid for being relaxed. Try not to pay attention to your pooch 30mins before you leave and repeat the same action after you come back into the house. Again, it is important to only reward your pet when he or she is calm and relaxed. Another useful method is desensitising your four-legged companion to stimulus associated with you leaving home (e.g. picking up your keys, putting on your work clothes, etc). Try picking up your keys and not leaving the house. Make sure you ignore your pet if he or she shows anxiety. Reward when calm. More advanced training include taking short leaves away from home and gradually increasing the time your doggie is left alone at home. Exercise and toys are always a good addition to the above training methods. Is my dog afraid of something, Newstead Vet? Is there construction work occurring nearby? Noise coming from your neighbours? Sometimes normal noises you encounter everyday (such as lawnmowers and thunderstorms) can cause fear in your pooch. Is my dog an attention seeker, Newstead Vet? Occasionally when I look at dogs barking at their owners, I can imagine them saying “Look at me! Look at me daddy! Look at me! Wee! Look look look at me!” You can simply modify this attention-seeking barking by ignoring them. Try avoiding eye contact, not talking to them or walking away from them. Reward your furry kid only when he or she is calm and relaxed. Is my dog territorial, Newstead Vet? 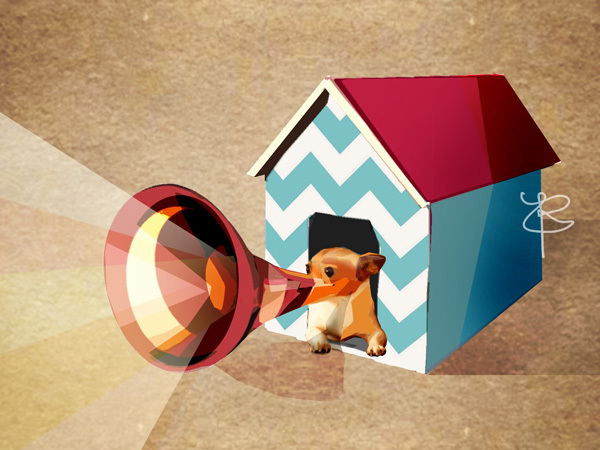 Is your neighbour’s dog inciting your pooch to bark? Do you live on a busy street with many passer-bys? Try associating these stimuli with rewards. It is important to only reward when your doggie is relaxed and not barking. Organise a play date with the dog next door or get your neighbours to give treats every time they walk passed. If you have tried the above methods and are still not having any luck, then perhaps it is time to consult a veterinary for medical intervention. If you are looking for a trusted Newstead Vet, please contact Fortitude Valley Vet, at (07) 3216 0045.